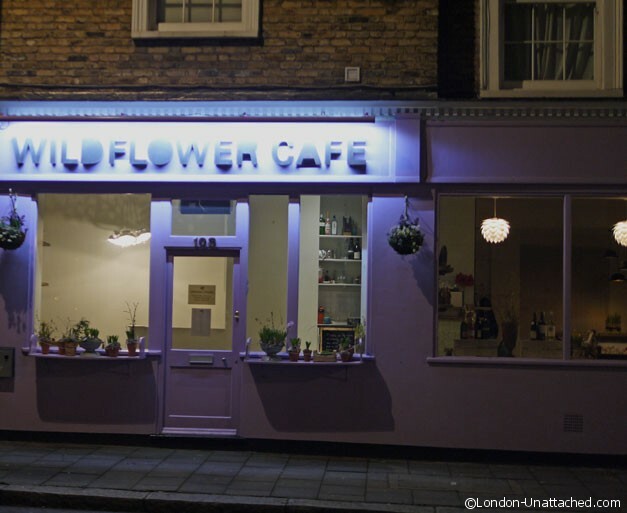 On the northern edge of Notting Hill, a few minutes walk from Westbourne Park tube the Wildflower Cafe is the sort of neighbourhood restaurant I’d like to have a little closer to home. Opening in the morning for breakfast or brunch, by day they serve cafe style food – cakes, coffee, salads and soups. But in the evenings the place is transformed into a cosy bistro where you can enjoy a three course meal with wine. It’s quite a challenge to offer that kind of extended service, but Wildflower Cafe served up a simple, fresh menu with great charm and style. Inside the pretty, shabby chic decor is complemented by some neat touches like the magritte style hat-lightshades and pretty hyacinths on every table. 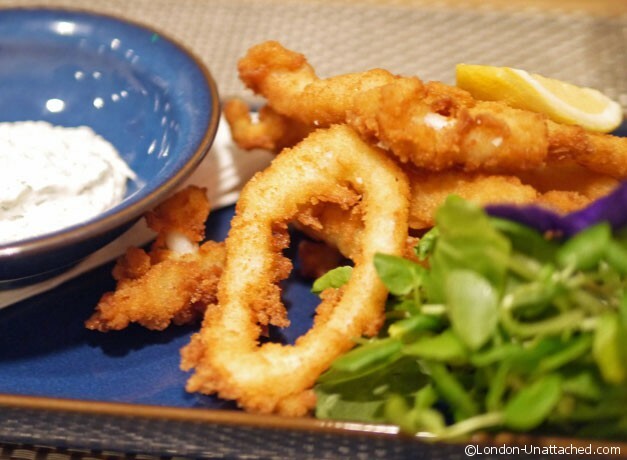 I started with panko fried calamari with homemade tartar sauce. It was the sort of dish I’d like to be able to produce at home. But if I made it the result would be not quite so pretty, not quite so perfectly cooked and just not quite so good. 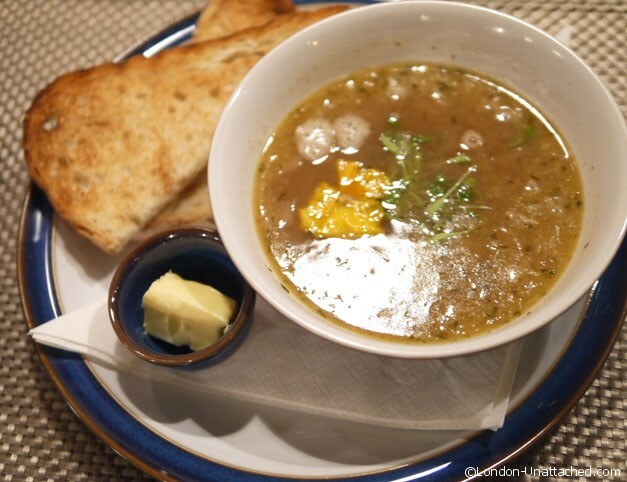 My friend picked the roasted shallot and chestnut soup which looked almost oriental in style. 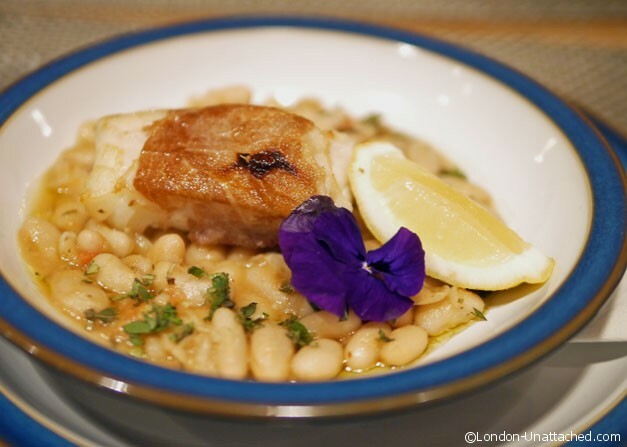 My main of proscuitto wrapped cod loin with cannelli bean, tomato and oregano was delicious. Again, the sort of dish I’d try to make at home and fail to produce anything quite so neat. Mind you, I don’t have a ready supply of pansies to make my dishes look pretty. The aim so the chef told us was to serve up a menu of food every day that was seasonal and fresh. He told me that he’d spent time working for Theo Randall and in the kitchens of Moro. A strong heritage that is evident in the style of food on the menu. 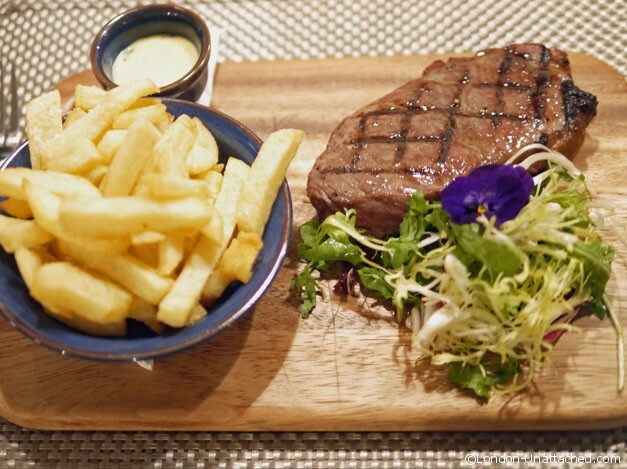 My companion picked the 28-day aged sirloin steak with handcut chips and bernaise. A classic dish that isn’t easy to serve up well, there’s little to hide behind. In fact it did arrive closer to rare than medium as ordered, but it was quickly swapped and returned to the table with extra (welcome on my part) hand cut chips. So lovely and friendly was the service that I hesitated to mention our only issue of the evening, but personally I think a willingness to correct something like a steak order without question reflects rather well on a restaurant. 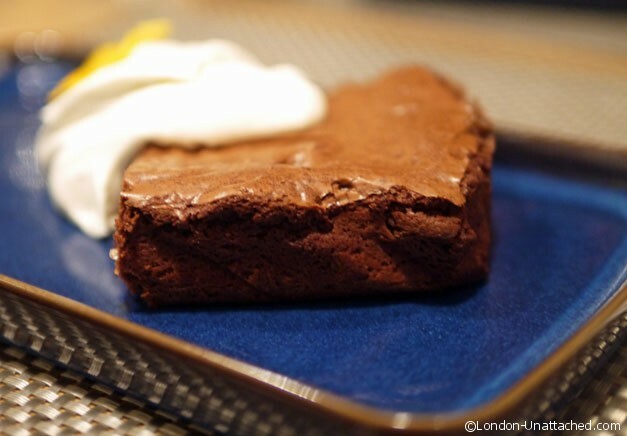 On to desserts – I HAD to have the 70% Valhrhona chocolate brownie, which arrived with a fragrant dollop of cardamom cream. Lush and rich for me a brownie is always a great dessert, especially when it’s made with good quality chocolate, not over sweetened and served simply with cream. 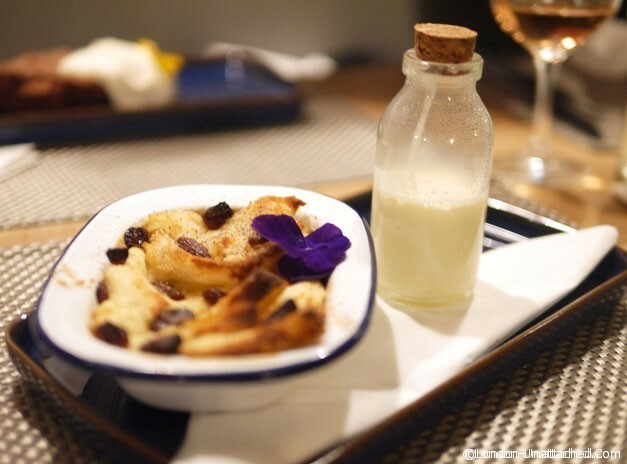 My companion picked the bread and butter pudding which arrived in a little tin dish, with a tiny bottle of fresh custard to serve with it. All in, while this isn’t a budget evening out, it’s well worth paying for good quality food served without undue fussiness in a friendly and warm environment. Wine is good value for London too, with a glass of prosecco just £5.50 and bottles of wine from £17 to £32 for the most expensive a Terra Scura Chianti Classico DOCG Capoleto. have made a note of this one! 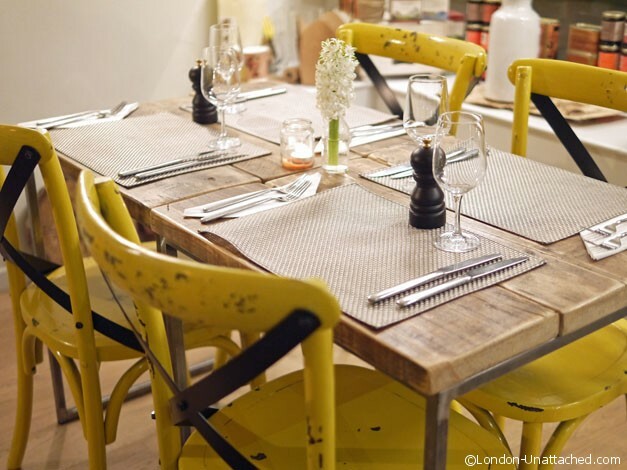 This looks lovely – quirky and unpretentious and the food looks good and served up with nice little touches. The sort of place where you could just have a pleasant and relaxing meal. This restaurant sounds right up my street! 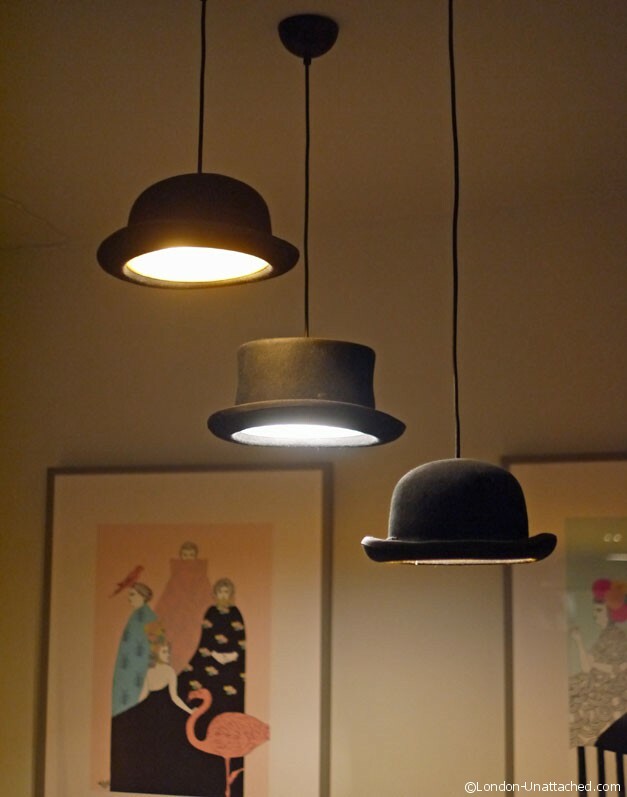 Love the decor (especially the bowler hat lights) and that 28-day aged sirloin steak is cooked to perfection!